Nabû-mukin-zēri, inscribed mdAG-DU-NUMUN,[i 1] also known as Mukin-zēri,[i 2] was the king of Babylon 731–729 BC. The Ptolemaic Canon gives his name as Χινζηρος. His reign was brought to its eventual end by the capture of the stronghold of Šapia by the forces of the Assyrian king Tukultī-apil-Ešarra III (745–727 BC). The chief of the Chaldean Amukanu tribe in southern Babylonia, he took advantage of the instability which attended the revolt against Nabû-nādin-zēri and deposed its leader, Nabû-šuma-ukîn II. The fortuitous discovery in 1952 of a cache of diplomatic correspondence in the chancery offices of the Northwest Palace in a room designated as ZT 4 at Kalhu, modern Nimrud, by archaeologists led by Max Mallowan, has shed much light on events of the Mukin-zēri rebellion. 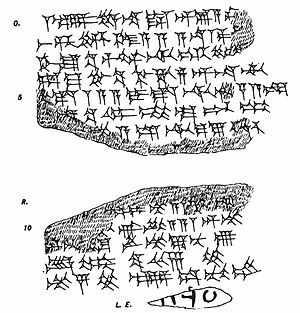 Of the more than three hundred tablets uncovered, a group of more than twenty letters and fragments concerned the events in Babylonia which led to Assyrian intervention and subsequent annexation of the region around 730 BC. They paint a picture of Babylonia riven by splits and rivalries among the various Aramaic, Babylonian and Chaldean factions. The Chronicle on the Reigns from Nabû-Nasir to Šamaš-šuma-ukin describes the final outcome, “In the third year, the Assyrian king having come down to Akkad, ravaged Bīt-Amukanu and captured Nabû-mukin-zeri. He subsequently ascended the throne in Babylon himself.”[i 3] This chronicle is not wholly accurate as a contemporary letter addressed to Tukultī-apil-Ešarra[i 7] has been preserved which reports that "Mukin-zeri has been killed and Šumu-ukin, his son, has also been killed. The city is conquered." Tukultī-apil-Ešarra did, however, ascend the throne of Babylon, officiating over two successive Akītu festivals. ↑ 1.0 1.1 Economic text MLC 1805, published as BRM 1, 22 r 13 is the only exemplar of his full name. ↑ Kinglist A, BM 33332, iv 7. ↑ 3.0 3.1 Chronicle 1, i 18–22. ↑ Tablet ND 2632, 5–17. ↑ Tablet ND 2717, 48–49. ↑ Mogens Herman Hansen (2000). A comparative study of thirty city-state cultures: an investigation, Volume 21. Kongelige Danske Videnskabernes Selskab. p. 125. ↑ J. A. Brinkman (1968). A political history of post-Kassite Babylonia, 1158–722 B.C. Analecta Orientalia. p. 238. ↑ Peter Dubovský (2006). Hezekiah and the Assyrian spies. Pontifical Biblical Institute. pp. 161–168. ↑ J. A. Brinkman (1984). Prelude to Empire: Babylonian Society and Politics, 747-626 B.C. 7. Philadelphia: Occasional Publications of the Babylonian Fund. pp. 42–43.